Many international investors have an overseas stock broking account in either Singapore or Hong Kong. This allows them to invest in Asian markets cheaply and easily, while still doing business in English with reputable firms in a sophisticated financial centre. The simplest option for offshore accounts is Singapore and that’s what this article will focus on. However, the international stock broker guide also includes a comparison of the best Hong Kong stock brokers and one of those would also be a good choice. The good news is that opening a non-resident Singapore stock broking account is extremely easy. Most stock brokers welcome foreign clients of all sizes. You do not need to be investing tens or hundreds of thousands of dollars – a couple of thousand will get you started. If you are a US citizen or resident looking to open any kind of financial account anywhere outside the US, see this article on the added problems you face. However, at the moment it seems that some Singapore brokerages will still do business with you. Obviously, your first move is to pick a brokerage firm. There are eleven stock brokers in Singapore that deal with retail investors and most accept non-resident investors (possible exceptions appear to be Citibank Brokerage and Standard Chartered). Details of all are available in the international stock broker guide and Singapore stock broker comparison table and you should shop around to see what suits you. However, the best choice for many international investors will probably be either OCBC Securities or Phillip Securities. These two offer the best range of markets, with reasonable fees and commissions. They also have good customer services and knowledgable staff – although none of the Singapore brokers seem to be too bad on this score. OCBC Securities reportedly currently accepts American citizens and residents and some of the others may do as well (one exception is DBS Vickers, which explicitly states that it does not). US residents will not be permitted to trade US markets through their Singapore account, but should face no other restrictions on which markets they can access. The easiest way to open a brokerage account in Singapore is in person. If you’re planning a trip there anytime soon, opening your account when you visit is a good idea. If you’re not planning a trip, you could consider one, perhaps for your next holiday. That may sound excessive, but it will save you a lot of paperwork. And when you’re opening an overseas account, it’s never a bad thing to visit the company and meet an account representative face-to-face, to get more comfortable with where your money is going. You will need to visit one of the stock broker’s customer centres. There are branches for most of the firms in the financial district, near the Raffles Place MRT stop. OCBC is on Church Street, DBS Vickers is on Cross Street, Phillip is on Robinson and Kim Eng is on Market Street. The awkward exception is UOB Kay Hian, which was in the UOB building opposite OCBC, but has moved the broker centre to Anthony Road (Newton MRT stop). You do not usually need an appointment – just turn up and wait your turn. You will need your passport for identification and sometimes proof of your foreign address (eg bank statement or utility bill). You should check with the firm you choose before going to Singapore in case their requirements have changed recently. Opening the account involves completing a number of forms, so you should set aside an hour or so. Apart from opening the brokerage account, you will also need a personal account with the Singapore Central Depository (CDP), which keeps the records of who owns which shares. If you want to trade Malaysian shares, you will also need a personal account with the Malaysian depository. You will usually also be asked to complete US form W-8BEN, which allows you to receive US dividend payments with the 30% withholding tax rate reduced to 15%. The account representative will help you complete all these forms at the same time. Be aware that if your day-to-day signature does not exactly match the one on your passport, you may want to practice getting them the same before going in. Due to local regulations, firms are extremely cautious about ensuring that signatures match. You may be asked to sign some forms several times before the representative is happy that they are similar enough. It is possible to open for foreign investors to open a Singapore brokerage account by post. You will need to check the requirements with the firm you want to use, but essentially the key step is usually to have all the account opening forms and copies of your identification documents certified by a lawyer or notary. All firms offer online access to some markets, but you will also be assigned a trading representative. When you want to trade a market that is not available online, he or she will execute your orders. You can place these broker-assisted orders by telephone or by email. The latter is probably more convenient for overseas clients in different time zones. Your trading representative is your first contact for account queries. A good one will also send you a steady stream of research notes for the Singapore market. Before you can trade, foreign clients will usually be obliged to place a minimum amount of money on deposit in the account. This acts as some security against you purchasing large numbers of shares and then failing to provide payment by the settlement deadline. You will not need to pay this in on the day – you can transfer it in later on. But you will not be permitted to trade until the deposit is in the account. The typical deposit is S$2,000, which cannot be traded and must remain in cash. Phillip Securities asks for a minimum of S$5,000, but allows this to be invested in the market. You do not need a bank account in Singapore to have a brokerage account. You can wire funds directly to your stock broker and spare cash can be held in your trading account, usually in multiple foreign currencies. You should be able to send funds from your home bank account via your bank. But you may get a better exchange rate and lower fees by using a specialist currency transfer service, as discussed in this article. However, opening a non-resident bank account in Singapore is simple and it makes sense to do this at the same time. Having a bank account will give you added flexibility when it comes to paying in and withdrawing money. The three local banks (DBS, OCBC and UOB) and Citibank are part of a system called Electronic Payment for Shares (EPS) that allows next-day transfers between your bank account and your brokerage account. If your stock broker is one of the three bank-owned ones, it makes sense to go with the same bank, since transfers are even quicker and simpler. For more information, see the article on opening a Singapore bank account. A good choice among the banks is OCBC, which is another reason to choose OCBC Securities for stock broking. Conveniently for visitors, OCBC’s broker centre and main bank customer centre are in the same building, just by Raffles Place MRT. How safe is my money in Singapore? When opening a foreign brokerage account, it’s very important to think about how safe your funds are. This account will not be covered by the investor protection rules of your home country, but by those of the country the stock broker is located in. Singapore has a sophisticated and well-regulated financial system, with high-quality financial institutions. Stock market and stock broker regulation and oversight are handled by the Singapore Exchange (SGX) and the Monetary Authority of Singapore (MAS), the country’s central bank. In the event that a stock broker collapses and your securities or cash are missing, the SGX’s Fidelity Fund will pay compensation of up to S$50,000 (covering trades done on the Singapore Exchange only). Obviously, this only applies to money lost due to a company collapse or fraud. Losses that you incur in trading the markets are not compensated under any investor protection scheme anywhere in the world. However, you don’t really want to be relying on investor compensation schemes anyway – it’s best to go with a reliable stock broker. DBS Vickers, OCBC Securities and UOB Kay Hian are all owned by Singapore banks, which are very solid and well-run firms. In an extreme situation, the likelihood of support from the Singapore government is very high. Kim Eng and Phillip Securities are long-established and well-regarded independent brokerages. Kim Eng has recently been bought by Malaysian bank Maybank, while Phillip remains independent. 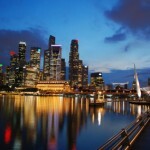 The Singaporean government carries the top AAA credit rating from all major ratings agencies. It has a long track record of fiscal prudence and good management of its financial system.